I’m having such a good time knitting this Hedgerow that I think I’ll finish it by tonight. I know the pattern by heart, so the knitting is easy and straightforward. I think I’ll use the round toe this time. 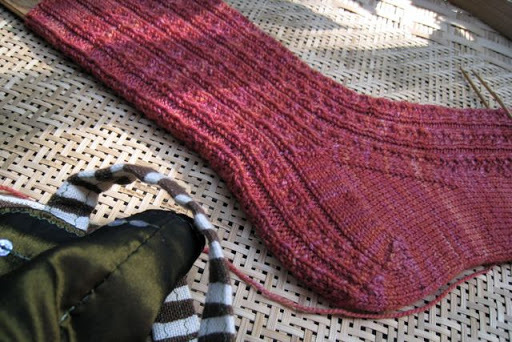 Then it’s on to the second sock, and who knows, I might finish the pair this week. Earlier in the summer I discovered that my Hedgerow Sock pattern had been chosen to be included in the Sock Museum’s Iconic Socks Collection. What an honor! I only wish I could have knitted the pair that is on display, but I’m really pleased that we — me and Knitter’s Review — are represented. It’s been rainy for the past few days, but by noon today the sun was out and a nice breeze began to make the humidity level drop. There are crickets in the grass, and the neighborhood is quiet, as if there’s no one home. Just a week ago there was traffic and the sounds of lots of activity, but now all I hear is an occasional car, or a door closing, or a dog barking. It’s nice. I’ve been hearing an interesting bird call at night lately, and until this week I didn’t know what it was. It’s a soft, mournful call from up in the trees, almost like a far-off whinny. I googled around and found out that it’s an Eastern Screech Owl. Now I have a way to thank him when he stops by my house in the evening — I have always loved that sound (and there’s nothing very “screechy” about it). I know a crazy knitter who wants to go to Antarctica. Eva is her name, and she blogs at Out of Yarn. The trip is sponsored by Quark Expeditions, which is looking for an Official Blogger. She should get to go, and we can help her by voting for her here.There’s information about the trip and Eva’s interest in it in her September 8 post. So go vote! A sock toe is calling me, and I think I’ll listen to it. It’s been a good day off! Woot! Thank you for posting that! (I love finding it randomly on a blog I'm reading! I feel so happy inside! 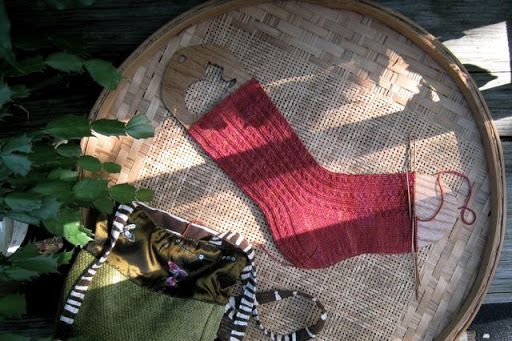 )Excellent to see you posting and knitting regularly. I've missed you. That color knitted up beautifully. You have a friendly neighborhood if owls are hooting nearby…. love the socks.I seem to recall that I have a pair percolating somewhere…. (note to self, find out where I left them and finish)I love the hoot of the owls. And they seem to find me, wherever I am living..
Lovely socks! I had an owl behind the apartment where I used to live. I miss him now. Playing catch up here (as always) . . . Lovely socks!Look, hair! Congratulations on that and on the port removal. Wooohooooooo! You're so lucky to hear owls nearby. When I was a kid, I was disappointed to learn that what I thought was owls hooting was really mourning doves cooing. Oh Jane you are a star, such lovely knitting, it got me started and it inspires me still.Tah everso. ( That's native english for thankyou ever so much).